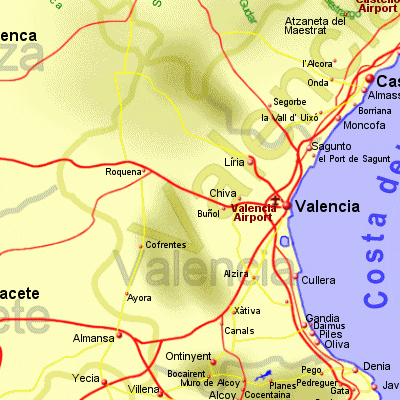 Valencia province, the central province of the three in the region of Valencia (and also where the city of Valencia lies) has a population of 2.5 million people, more than the other two provinces in the region combined. Of that population, one third live in the city of Valencia, Spain's third largest, after Madrid and Barcelona. Together with being an important commercial centre, the city of Valencia has a lot to offer the tourist, with the most famous being the Science Museum, not just for what you can see in the museum but also for it's modern architecture. However, Valencia province is also an important agricultural area with low fertile land near the coast watered by rain that falls in the hills. Much of this land grows fruit trees. Immediately south of Valencia city lies the wetland Albufera Natural Park, where a freshwater lagoon is separated from the sea by a narrow spit of land. The Albufera has an important bird population and also has large area of rice production. Valencia is of course home to the famous rice dish, Paella. The coast is not as popular with tourists as the Costa Blanca to the south or even the Costa de Azahar to the north, however there are excellent beaches and small resorts with all the facilities a tourist needs.